Maire Clerkin is a registered teacher (TCRG) with An Coimisiun le Rinci Gaelacha (The Irish Dancing Commission, based in Dublin, Ireland) and certified adjudicator (ADCRG). She teaches Irish Dance at Loyola Marymount University as a part-time faculty lecturer. A master Teaching Artist for Los Angeles Music Center for ten years, Maire runs Irish Dance and Drama courses for schools in Southern California in line with arts curriculum programs. A busy adjudicator on the feis circuit, Maire loves to judge dancers of all ages and levels. However, she also enjoys teaching adults at Dance Arts Academy for fun and fitness - not for competition. Over the years, Maire has enjoyed teaching at University of Limerick, on the MA programs and Blas Summer School. Máire Clerkin is an Irish Dance teacher, choreographer, performer, adjudicator and writer. She leads A Gaelic Gathering – Irish Music & Dance ensemble, on artist rosters for Segerstrom Center for the Arts and The Music Center in Los Angeles. Originally from London, Máire lives in Los Angeles and tours her one-woman show 'The Bad Arm – Confessions of a Dodgy Irish Dancer' in North America and Ireland. For those of you who regard Irish Dance as that glitzy Riverdance show, or a pleasant diversion around St Patrick's Day, please add this: it is a vibrant, accessible discipline used in schools to help children tackle the world through the arts. As an actor-writer-dancer, I had long wanted to incorporate my theater training into education programs. Outside of schoolwork, I was choreographing dance drama pieces for Irish Dance academies across North America – these works won numerous regional and national awards. Why couldn't I translate this for the classroom? Well, eventually I did. 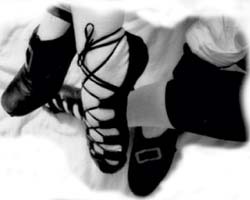 Several years ago, I created an 'Irish Dance Drama' program for schools, designed to contain the curriculum standards. Selecting favorite Celtic folk tales, I devised ways to make them appropriate for a range of elementary school students; by combining acting skills (gesture, creative movement, ensemble speaking) with Irish Dance (basic steps, partner work, social formation dances, rhythm games) and literacy (storytelling, group re-telling, class discussions using vocabulary, description, imagery). In a typical Irish Dance lesson, students get to role-play with vivid characters, create movement relating to plot and scene development, practice teamwork through ensemble speech of key phrases in the story – and by dancing and moving together. Whether it be eternal youth and respecting one's elders, explored in The White Gander, or brain over brawn in The Giant's Causeway, universal themes encourage children to invest in the stories and make them their own. Because the tales' characters have supernatural appeal and unusual names, often in Gaelic, the students become curious about the culture, the place, and ultimately the expression of the people. Drawn into dancing by recordings of Irish music in class, most kids engage enthusiastically with all aspects of the program. Even those who resist dancing will participate in body percussion and rhythm routines. Hands up any teachers out there who doubt that 'cool' kids eventually join in! Of course we teaching artists are forever banging on about 'process over product'. But when it comes to it, there's nothing like a culminating performance to galvanize kids and teachers into theater zealots! Dance practice, scene rehearsal, prop and costume gathering, and Celtic Art flier production all gather pace as the show date looms. In a school where different classes partake in the residency program, I assign each one a scene from my script, to portray the Celtic tale in several acts. Irish Dance Drama is an interactive, ancient-meets-contemporary, walking-talking, dancing journey, designed to bring out the expressive, collaborative, physical, inquisitive side of every student. As we face a generation of children whose daily use of the written word is reduced to text messaging, what can we do? Instead of despairing at students' preference for movies and video games over books and newspapers, shouldn't we adapt ourselves to their tastes? They are, after all, moving with the times. Most kids will relate to the larger-than-life characters found in TV dramas, animation and DVDs. They do not, as a rule, identify with the creators of these media. Students seem surprised at the notion of writers inventing their digital heroes. The modern world has broken the thread between storyteller and listener – and yet students devour imaginative ideas, they delight in creating their own, given the chance. I am dismayed at some schools I go into, with their strict rules for writing pasted onto the classroom walls. Correct grammar, though important, can intimidate a child. Instead of encouraging and nurturing fresh ideas, we seem to be putting up roadblocks that discourage children at the outset. Young people need to see themselves as the thinkers, creators and writers of the future. If that future is electronic, so what? In response to the censorious nature of some educational thinking, I came up with 'Write-Move; Literacy Through Dance'. It enables students to write creatively, to develop an interest in words, by expressing their thoughts with clarity. It combines physical activity with mental reaction and reflection. Students are taught Irish Dance for half an hour, and then spend the remainder of their one-hour lesson time discussing and writing about it. Its immediacy means students are ready to voice their individual experience, to write it down there and then. In a ten-lesson residency, students gain ability and confidence to separate fact from opinion, express original views, describe experience, create imagery, critique and edit, distinguish writing styles, and yes, grasp the basic rules of composition, sentence structure and grammar. Class teachers love it and actively support the program. My program aims to instill a sense of exuberance in dancing and in writing. Many students feel that either or both are beyond them. At the very least, the physical exertion ignites their brains, stirring them into intellectual activity via animated debate. Passivity is challenged and students discover the beauty of text over texting. Students discover how to create a theater performance from Celtic folk tales, involving movement skills, ensemble speech, improvisation, role-play, teamwork, imagination and Irish Dancing. Irish Dance Drama is typically a 10-session residency that enables students to experience the power of the written word, raise literacy, discover cultural traditions and build physical coordination and musical awareness. Students will gain a basic knowledge of Irish Dance, which they can apply to the dramatic reenactment of magical folk tales from Ireland. Ideally suited to support the curriculum in Language Arts, Irish Dance Drama focuses on interpreting text through participatory movement, rhythm games, partner work, character creation and traditional Irish Dance steps. Each class gets the opportunity to enact a scene from the story in a culminating performance. Adaptable to different grade levels, program lengths, and adhering to California Content Standards. Sample tales: Magic Shoes; Finn McCool; The White Gander; Children of Lir. Máire teaches for Aimee Art Productions and directed a well-received production 'Oliver' at Thomas Starr King Middle School in 2012. Dancer-Storyteller, Máire Clerkin enchants children with gripping folk tales from Ireland. Mixing magical stories with bursts of traditional Irish Dancing, Máire conjures up talking horses, flying trees and wise old witches in a delightful, interactive, rhythmical and language-rich program! Máire Clerkin is a writer, choreographer and leading exponent of Irish culture. As a certified teacher and adjudicator with the Irish Dancing Commission in Dublin, Máire directs award-winning dance drama productions. She is a Teaching Artist for the Segerstrom Center for the Arts and Los Angeles Music Center, with education programs in dance, drama, and literacy with movement. An accomplished actor and storyteller from London, of Irish parents, Máire is a hit with youngsters of all backgrounds. Máire Clerkin qualified in 1980 as an Irish Dance teacher with the Irish Dancing Commission, Dublin. She ran her own Clerkin School of Irish Dancing in London until 1993. The school holds fond memories for Máire and she still misses having the craic with her dancers, (particularly those mad teenagers). "She is a conceptual thinker, has excellent communication abilities and understands how to integrate ideas and themes into many areas of the curriculum" - Susan Cambigue-Tracey, Director of Curriculum and Teaching Artist Development, Music Center, Performing Arts Center of Los Angeles County. "Her authentic and personal approach brings Irish culture alive for students of diverse backgrounds and experience" - Jason Siebert, Manager, Community Programs, Orange County Performing Arts Center. In 2006 Maire first taught dance in Australia and returned in 2010 for another successful series of workshops. She choreographed the Nationals winner of the 2 hand dance in '06 and created 3 new figure dances in '10. "A superb communicator and spokesperson for her art and her culture" - Diana Cummins, Co-President California Dance Educators Association. Teaching credits include being Director, Dance of Ireland at Loyola Marymount University, and Teacher-Choreographer on MA Irish Dance at University of Limerick. Máire was a guest speaker at UL's Dance Theatre Symposium in 2008. Since moving to California from London in 2003, Máire gained a Professional Designation in Arts Education with LA County Arts and the Los Angeles Music Center Education Division. She runs education programs for the Music Center and for Orange County Performing Arts as a Master Teaching Artist. Máire teaches Irish dance and drama (including Celtic folk tales) in schools and colleges and has recently added Write-Move! - her literacy through dance program. Maire Clerkin offers the following programs for Theatre, Irish and Dance faculties in colleges and centers of learning.